Listed in William Michael Rossetti's 1908 inventory of the artist's work, no. 81. Angela Thirlwell, William and Lucy: The Other Rossettis, Yale, 2003, pp. 176-178, fig. 96. The eldest of Ford Madox Brown's three surviving children, Lucy acted as her father's model and studio assistant from an early age, but only began to paint herself in 1868. She made her debut at the Royal Academy the following year, and continued to exhibit there, at the Dudley Gallery and elsewhere. Most of her work is in watercolour, a Romeo and Juliet of 1871 (Wightwick Manor, Wolverhampton) being generally considered her masterpiece. In 1874 she married William Michael Rossetti, her senior by fourteen years, and with the arrival of children devoted less time to painting. 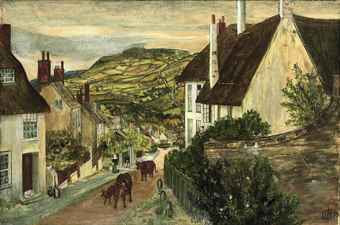 The present landscape was made in the summer of 1878 (it must have been dated when it was exhibited the following year), and is one of several she executed during family holidays at this period. Others showed views at Lynmouth (1872) and Broadstairs (1876). William Michael also made a pencil sketch at Charmouth (Thirlwell, fig. 95).